Why should I get coaching period? Why should I choose Ethos over the other options available to me? Have you ever asked that question or a similar one? What’s the BIG deal with Ethos? With the help of Ethos leaders old and new, we threw together some cool facts. Let’s take a historical look, in no particular order. I invite you to be the judge. Tl;dr. Since we started, we have won the highest competitive awards available dozens of times in 7 different forms of competitive speech and debate, throughout more than 5 separate leagues. We have coached students from novices to national champions. We’ve trained toastmaster trainers, written books, and built a literal dynasty of debate credentials in high school, college, and the professional world. Ethos Debate coaches were asked to run a Mock Trial team in Virginia. Their first season they beat the 3-time state champions and won the title, they also went to nationals the next 2 years running under Ethos coaches. Ethos Debate coaches were asked to train at Toastmasters train-the-trainer events in the Washington, DC area and started a debating format for adults. EthosDebate coaches were brought in by the Fairfax Co. Chief of Police (for context: Fairfax Co. is an elite police unit that sends helicopters to Haiti in crisis and other crazy stuff). Isaiah and Kawika put on an immigration debate representing both sides of an enforcement topic to the top 50 leaders, to frame and de-escalate the debate and launch a helpful dialogue. Ethos Debate coach Isaiah McPeak personally coached 10 national champions. 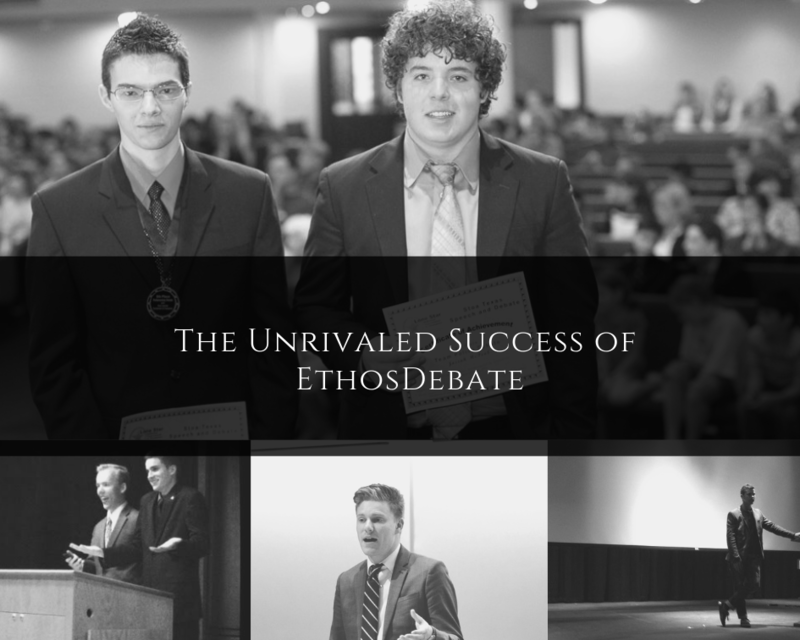 Ethos Debate coaches co-founded the Vector, VA debate club in Purcellville, Virginia. Their club broke the most to out-rounds at nationals of any club (5 teams), took home multiple 1st place titles, and won every regional tournament for three consecutive years. They also boasted the top Parli and TP teams in Stoa, Virginia, 3 years running. They were coached by Isaiah, Thaddeus, and other Ethos coaches over 8 years. Ethos Debate coaches built the Patrick Henry College policy and parli debate programs, winning too many tournaments to list as well as national 1st place trophies. Ethos Debate co-founder Isaiah McPeak co-authored Upside Down Debate, a unique “real life examples” approach to learning debate. Instead of spending years translating debate jargon to your real-world professional career, Isaiah does that for you by teaching in modern language from the beginning. In 2014, Ethos held a Nationals Intensive Training Camp to help NITOC-qualified competitors get a leg up on the competition. The results speak for themselves: 75% of LD NITC students broke to out-rounds at Nationals and 50% of TP quarter-finalists were NITC students. This last debate year, Ethos branched out into NSDA. A southern California high school, Sage Hill, reached out to Thaddeus Tague to ask if he or Ethos could help them improve. Thaddeus started working as the debate coach at Sage Hill. Sage Hill had an already formidable debate program, but after the discussion and drills, Ethos provided, Sage has, in one form of debate or another, won 5 out of the last 5 tournaments since the season started. They have won in WSD, LD, and final’ed in PF. *Obviously we are going to miss some achievements, send us an email if you see one missing! These are just the one we could confirm. Patrick Shipsey (NCFCA TP Champion). Isaac Kim (NPDA 7th pace national speaker, multiple 1st place NPDA awards, 2012 NCFCA TP National Champion, multiple 1st place speaker awards). Ryan Collins (NCFCA TP champ, WUDC novice nats finalist). Benjamin Griffith (NITOC LD finalist, Interp. Champ). These people are currently, or have gone on to be Lawyers, research associates, editors-in-chief, authors, public advisors, communication consultants, debate coaches, finance executives, policy analysts, and more. The Ethos Debate curriculum and model isn’t just about teaching debate, its about teaching communication tactics that represent the broader narrative of mature and critical dialogue our culture desperately needs. Ethos Debate not only has one of the most eclectic success histories in the industry, and it all goes to prove one thing: our method works. Teaching communication principals that transcend debate and mimic real-world persuasion, helps our students and coaches succeed.